Guildford Serves up Feast of Attractions for the Travel Trade. Showcase Sheds Light on Town’s Popularity for Groups. Tour planners from all over the country sampled a taste of Guildford during a mouth-watering showcase experience. Arranged by Visit Guildford, coordinated by travel trade specialists Steve Reed Tourism Ltd in conjunction with local attractions and the Holiday Inn Guildford Hotel, the Guildford and Surrey Hills Group Showcase [27-29 Oct] offered a true taste of this remarkable group-friendly area. Fact-finding visits were sprinkled with food and drink samplings provided by some high quality attractions such as Silent Pool Gin of Albury; the Hogsback Brewery of Tongham and the Denbies Wine Estate in Dorking. 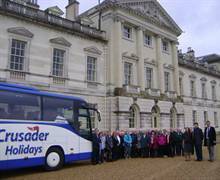 With transport provided by Guildford-based Safeguard Coaches, the group which included tour wholesalers, tour and coach operators and group travel organisers, took in trips to a number of group attractions. The event began with a walking tour of Guildford town centre which included the new Tunsgate quarter; Guildford Castle and Gardens; Guildford Town Museum and the centrally positioned and award winning Tourist Information Centre. 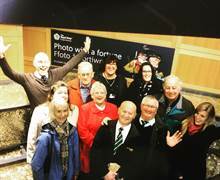 A ‘welcome to Guildford’ dinner was provided by the host hotel – Guildford Holiday Inn - when the group met the Leader of Guildford Council Councillor Paul Spooner and Councillor Nikki Nelson-Smith. Breakfast with the winged denizens of Bird World near Farnham was the next course for the tour buyers, followed by a tour of the adjoining and popular Forest Lodge Garden Centre. Painshill Park in Cobham was then served up to the group with a special tour of the majestic parkland complete with follies and lakes. The showcase then took off with a trip onboard the Concorde Experience at Brooklands Museum in Weybridge. Denbies Estate followed with a land-train tour of the extensive and dramatic vineyards overlooking the Surrey Hills. Tastings of the English wines produced there helped to fortify the group after a busy and bracing day. A last day of touring took in a mini workshop in the Guildhall on the High Street in Guildford where the delegates were welcomed by Councillor Mike Parsons, the Mayor of Guildford. This was also an opportunity to meet a number of other important attractions such as Hatchlands. Clandon Park and the Watts Gallery. The Royal Horticultural Society’s Wisley Garden was at its autumn best – especially when the group heard about the exciting new visitor facility now in progress at the iconic site. The VIPS were then cheered by a highly entertaining tour of the Hogsback Brewery before the final course produced by the majestic Guildford Cathedral – a chance to digest the many experiences served up by Visit Guildford during the showcase. 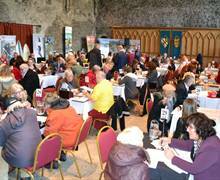 ‘We’re very grateful to the businesses involved in the showcase for pulling out all the stops to help ensure that the fact-finding event provided for a memorable experience for all of the visitors. ‘The event will generate new group bookings and can only help reinforce Guildford’s popularity with tour planners from around the country. We’re looking forward to those coaches and groups arriving in the months and years to come,’ says Diana. The group outside Guildford Cathedral. The operators outside the Guildford Holiday Inn Hotel. The group at RHS Wisley. The group at Brooklands after the Concorde Experience. 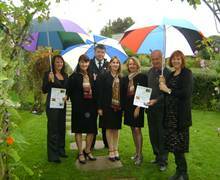 .English Riviera Welcomes Travel Trade. Tour Operators Descend on Southern Wales. Lift Off for New GTO Club. Steve Reed Announced as TWA ‘Champion’.